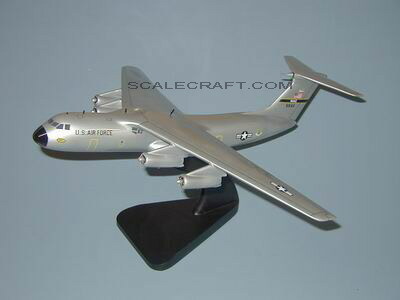 The StarLifter began squadron operation with MAC in April, 1965, with a large cabin which could accommodate 154 troops, 123 fully-equipped paratroops, or 80 stretchers with seats for up to 16 walking casualties or attendants. The aircraft's capability was amply demonstrated during operations in Vietnam, but it was soon realized that inflight refueling capability was essential, and that in most cases the C-141As had load capability greater than their physical capacity. Thus, in mid-1976, Lockheed received a contract for a prototype conversion of a C-141A, with the fuselage lengthened by 23 ft 4 in and inflight refueling capability added. The prototype for this C-141B airplane was first flown on March 24, 1977, and since that time 270 surviving C-141As have been converted, the last of them being redelivered on June 29, 1982. The aircraft was powered by four 21,000-lb thrust Pratt & Whitney TF33-P-7 turbofans, with a maximum cruising speed of 566 mph, and an unrefuelled range of 2,935 miles with maximum payload. A total of 284 StarLifters was built for the US Air Force. Mahogany Wood. Scale: 1/100. Wingspan 19 1/4 inches, Length 20 1/4 inches.